In case you haven’t heard, there’s a new, cheaper, easier way to catch a ride to the airport, or get home safely after a night on the town. It’s called UBER, and it’s just the type of disruptive service the traditional taxi companies hope you will never try. So much so, local taxi and limo companies have spent thousands in an attempt to go on the offensive to prevent UBER from becoming established in many cities here in the US and across the world. The concept is simple. First download the UBER app for your iPhone, iPad or iPod Touch and sign-up, or activate an account through any web-browser. All you need to sign up is an email address, your name and phone number, and a current credit card to link to your account. In addition, when you create your account you can also add a promo code if you have one. 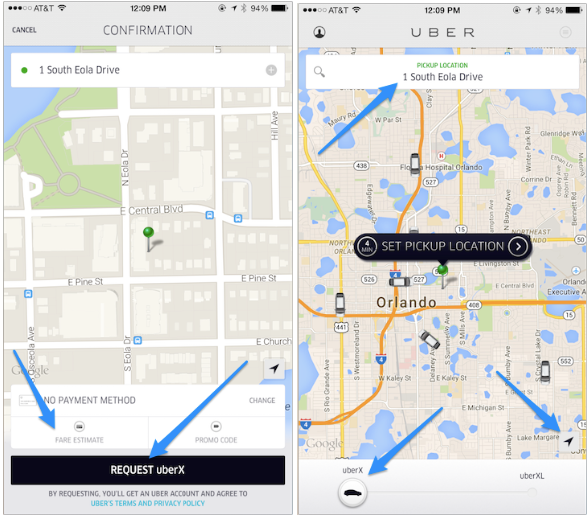 UBER has typically offered a free ride or promo codes in areas when they first launch their ride share service. So, you need a ride? How do you contact an UBER driver to come pick you up? First, launch the UBER app you already downloaded from the app store. Here you can either manually enter your current location or allow the app to use your location services from your phone to select your location. Here you can also choose between uber X (for up to 4 passengers) or uber XL (for 5-6 passengers). Riders choosing uber XL will pay a higher premium for the extra passengers, but the fare can be divided up among passengers who have signed up for UBER already. When you set you location your are shown available drivers in your area, and the estimated time it will take them to arrive at your location under current driving and weather conditions. You can also select the fare estimate button to get an idea of the prince range for the ride. You can follow the driver’s progress on their way to your location, and be notified when they arrive. If needed you can also text or call the driver to give them additional info they may need when they arrive like a gate code or any other special instructions. UBER routes all calls through their servers so the driver’s phone number, as well as your number are kept private. How to pay for my fare? When you arrive at your location, the driver selects on a separate app on their phone that the ride has been completed. At this point, both the driver and the passenger can rate their experience with each other, and the final fare is calculated and charged to the passenger’s credit card that was added to their UBER app. No cash or credit card transactions take place between the driver and passenger, unless a cash tip is offered by the passenger. That’s it! Check here to see if UBER has launched in your city. Have you ever used UBER before? What was your experience like?